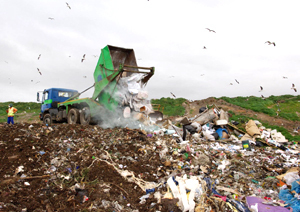 Solid waste management requires citizens, industries and government to work in a collaborative manner to minimise the flow of waste to landfill sites. The City of Cape Town estimates the following breakdown of waste generation: households 46%, industry 27% and commerce 26%. Research conducted on the capacity of landfill sites as the primary waste disposal option has found that, “based on the latest assessments, the remaining lifespan of the City’s landfills, when no additional diversions from landfill are implemented over and above current diversions and excluding private landfills, is between 12-14 years counting from 2010 onwards”. Despite the environmental and community health implications of mushrooming landfill sites, this manner of waste disposal is still the preferred method. Most municipalities in South Africa has by-laws in place and there is a growing recognition that waste has economic value – recycling and reuse creates economic activity and minimises health, socio-economic and resource impacts, thereby reducing the amount of waste that ends up in expensive landfills. Major industries have waste processing plants, and the economic value of these industries is considerable. However, the majority of municipal interventions in Cape Town, and for that matter other metropolitan municipalities too, has done little to improve the access for informal waste pickers to markets. Despite the emphasis on finding new solutions to waste management, especially recognising the livelihood aspect of informal waste pickers, little institutional and organisational capacity has been developed to take informal waste management to scale. Research and experience has suggested that it can be highly counterproductive to establish new formal waste management and recycling systems without recognising the role of the informal sector. There is very little organisational support to encourage job creation and livelihood opportunities in solid waste management and recycling, and poor people often do not benefit from this core municipal function. The Solid Waste Network (SWN) was initiated in 2005 in response to the growing demand of organised communities for livelihood opportunities. 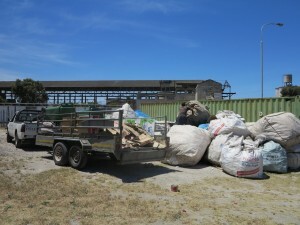 After learning about informal communities organising around solid waste in Nairobi, Kenya and Cairo, Egypt via Shack / Slum Dwellers International (SDI) exchanges, groups in Cape Town started organising and collecting first batches of glass, plastic and paper, and created direct links with the formal recycling industry. The project has 2 components: 1.) 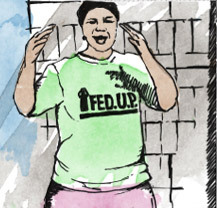 the SWN as a community-based network of communities of informal waste pickers, and 2.) the support system comprising of the collection and management team with a staff complement of five. The SWN promotes as socio-institutional approach to integrating informal waste pickers in the formal recycling industry. By creating organisational capacity to advance pro-poor and inclusive measures to integrating the poor, the SWN enables market mechanisms to work for the poor. The SWN has developed a socio-institutional approach to waste management, by merging access to markets with real time livelihoods support. Groups of waste pickers source waste at community level for income, adding to cleaner neighbourhoods, as well as environmental education. The collection team responds to the demands of the network, i.e. when someone is in need of cash, they make amendments to their collection plan. The SWN meets monthly as a learning platform on recycling industry and policy developments, as well as operational aspects to develop the income component. A community waste collection point is in convenient proximity for waste pickers, and acts as a learning process to replicate such buy-in model (large collectives of individual pickers) in other parts of the city. In Cape Town, the SWN has developed a working relationship with a number of industries: Paper (Nampak and Mondi); Plastic (Extrupek, New Heights and Proplus) and glass (SAB, Distell, Mega Metals, Consol and Macro). The SWN is recognized as a stakeholder in the industry, with lots of potential for expansion. The SWN, as an ISN initiative, is seeking to expand this model to communities in Joburg, Ekurhuleni, Durban, Port Elizabeth and the West Coast. Resource constraints are currently hampering this. 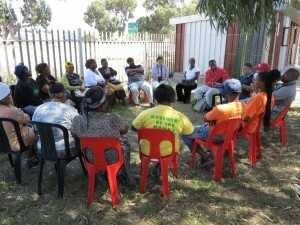 On 8 November, leaders of some of the larger buy-in centres in Cape Town gathered to assess the progress of goals in 2012, and to chart the ambitions for 2013. The Solid Waste Network (SWN) continually needs to assess the scale of current activities and operations due to the unique service the administrative hub provides, which is costly and receives very little external support. The administrative hub’s 5 members, repairs to the vehicles and other administrative costs are covered by the proceeds from the waste sold to the industries (CORC subsidises a large part of the fuel of the collection vehicles). 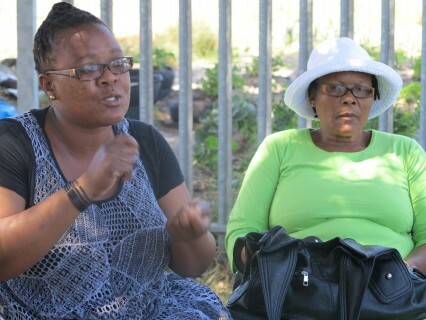 Marlene Busa, a single mother from Mitchell’s Plein, said that is was not easy for her to collect waste at the beginning. “Some people look down on you,” said Marlene, adding that “government should recognize us—us people who are cleaning our environment—because it is not a bad thing; it is a way of living. It is an income, and a service to the community”. 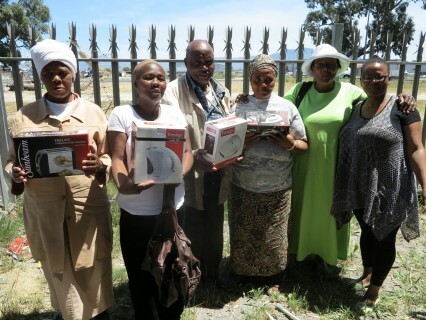 However, despite the service to the communities and to the City, some of the communities have experienced the disempowering effect of by-law implementation when their informal buy-in centres were shut down and/or fined (up to R20,000) by Metro Police because they did not have the relevant enterprise registration papers. Such unresponsive regulations hamper the initiatives of the poor. In 2006, we started have a half ton per month of glass, and that was collected in Section B, Khayalitsha. This year, we have set our sights on 50 tonnes of waste glass per month. I am happy to report that the Network has collected 54 tonnes this month. The point SWN wants to bring across is that you have to start small, and grow from there. The successes of Ms. Agnes Qhagana and her daughter Sheila (pictured above) were signalled out at the meeting. Sheila explained what they have accomplished in the past few years, being one of the first waste pickers to set up a buy-in centre in Khayalitsha. We started small in Interpark and worked most weekends, my mother and I. But now we have employed two guys to help us over the weekends. Fridays and Saturdays and the holiday months are especially good times to collect the waste. From the waste recycling we have also started a car washing business. We now employ eleven guys to wash cars and we are proud to have the biggest car wash in Spine Road, Khayalitsha. We have upgraded our yard and are looking to extend our house now. The other money we are investing. Mr. Kholer remarked that the “issue about recycling in tonnage. You must have volume”. John McKerry, the programme manager of the SWN, also reflected favourably on the past year. “What you put in is what you get out. Our service is like a lifeline to many households in desperate need of cash. The SWN is actually like a transport service that connects all the buy-in centres (the pickers’ collectives) and collects the waste at your house and create the income stream. If we work alone, transport will always be a problem. How will you get your stuff to the market if you work alone?”. John shared a story of a man who was impatient with that the transport team could not collect the waste in a given day. 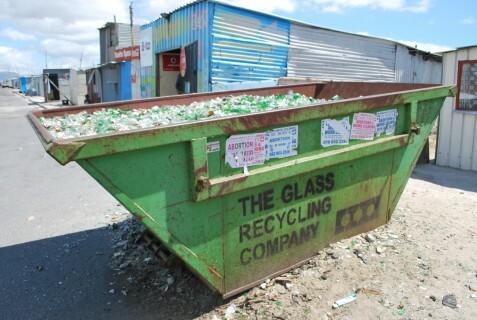 He had 630kg of glass and decided to rent a bakkie (pick-up truck) and deliver the glass himself to a recycling plant in Parow. Parow would pay him 40c/kg (transport not included) where the SWN pays 30c/kg (transport included). At the plant he received R252 for 630kg, but then had to pay the bakkie owner R250 for rental and fuel. He was left with nothing. The SWN would have paid him R190 at his house. 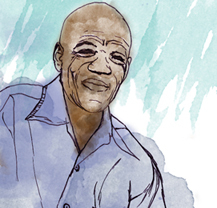 Informal pickers in Cape Town face hardships in collecting and managing waste as an income stream. But strength lies in the collective, and now the SWN can start engaging the City of Cape Town proving that collectively they remove 50 tonnes per month out of the waste stream. In so doing, the collective waste pickers are not only ensuring clear and safer living environments, but also contributing a vital service to the City of Cape Town, and saving public expenditure through minimising airspace cost (current municipal cost of landfilling is R327/tonnes). These costs must be compared to the opportunity costs of finding alternative waste management solutions, which should fundamentally include the role of informal sector workers. Prize winners for most tonnage generated in 2012.